St. Luke’s Episcopal Church is located in the Mesilla or Upper Valley near La Union, New Mexico and Canutillo, Texas . It began as a mission in the early 1900s to serve the pioneer families for their spiritual guidance. Rev. 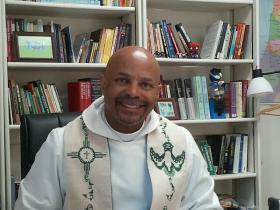 Henry Easter of St. Clement’s Episcopal Church in El Paso, Texas would make periodic visits to hold services in the Central School building, which is now part of St. Luke’s Sacred Grounds. As the population of the valley increased, it became necessary to build a small church. The cornerstone was laid in 1916 by the Rev. Hunter “Preacher” Lewis and “the little church in the cotton patch” (as it was fondly called) was consecrated in 1918. Several of the original founding families are still represented at St. Luke’s by their descendants, who are regular communicants of the church to this day. However, the congregation has grown, attracting families from surrounding communities and also from El Paso . Those who worship at St. Luke’s find a family oriented, gospel-centered community to help direct their Christian lives and point them to God. Every October, St. Luke’s just goes to the dogs. We are well known in the Boarderland for being the church with the Country Fair and Great Dachshund Stampede. This event has been growing for the last 35 years and has become one of the largest community outreach events in the Episcopal Church drawing thousands to our church property for brisket, pulled pork, roasted corn, children’s games, music and of course the Great Dachshund Stampede. People bring their dogs of all sizes and spend the day relaxing, eating and shopping. See the facebook page for this event listed under the Events tab.